Tuna and salmon in the can are considered healthy foods. But is canned chicken bad for you? Because we’re all short of time to prepare fresh food on some days, having something that’s quick and easy to make yet still nutritious is really helpful. In this article, we explore the advantages and disadvantages of chicken in a can. Are they something you should be eating or should you opt for something else? Canned Chicken: Good or Bad for Health? Canned chicken is delicious. It is useful in many recipes. And it is convenient for quick meals or snacks. These are some reasons why we pick them up from the grocery. While all these are good points, have you ever considered whether or not this kind of chicken is healthy or not? Sure it’s convenient, sure it’s cheaper. But so is fast food. And we all know that fast food is far from being good for us. Here are some facts that can help you make healthy food choices when it comes to whether or not you should pick up those cans of chicken the next time you go grocery shopping. Canned chicken is an excellent source of protein. Each 2 oz. serving yields around 12 to 13 grams of protein. The chicken is already made into chunks making it easy to eat with a fork or fill your sandwich. No more cutting or slicing needed. It contains a small amount of important dietary fiber. While brands may vary, it is generally low in fat, may not contain any sugar, and is a low-calorie product. 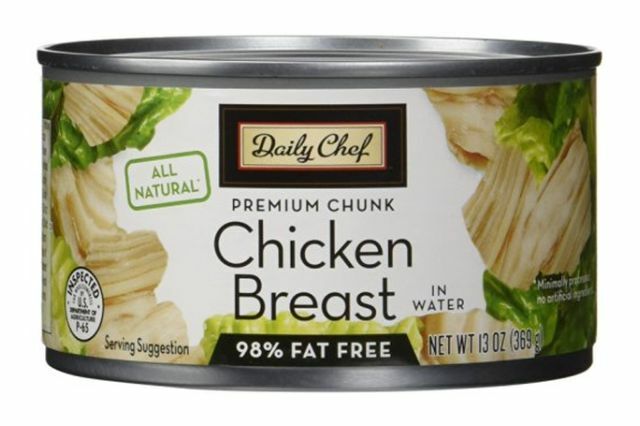 Most canned chicken is made from breast meat. This makes it lower in fat as well as cholesterol compared to some other parts of the chicken. However, there are some brands that can the whole chicken. In that case, the fat content will be a little higher. Unless they are clearly labeled low sodium, most canned foods have a high sodium content. Canned chicken is not an exception. While it varies from brand to brand, you may be consuming around 230 mg or more of sodium in one serving of chicken. Some go as high as 270 mg.
At 230 mg, you are approximately consuming 15% of the daily value of sodium recommended for average, healthy adults in one 2 oz. serving. That’s quite a bit of sodium. While healthy adults should monitor their intake of sodium, there are various health issues that make limiting sodium absolutely essential. 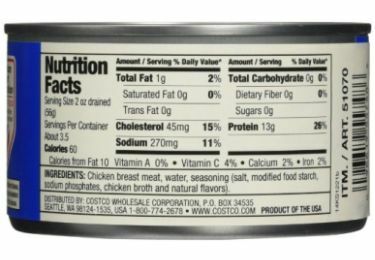 If you have a heart condition, high blood pressure, ulcers, or are prone to migraines, the high sodium content in canned chicken may aggravate your condition. Why Choose Organic Canned Chicken? 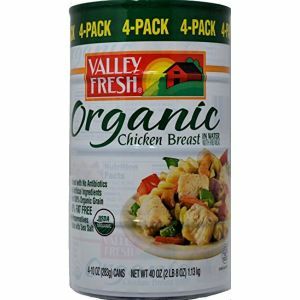 It can be more difficult to find, and may cost more, but if you want to eat canned chicken, a better way to go is to choose organic. Products that are not organic can contain hidden health hazards. While there can be preservatives and other artificial ingredients that you do not want to eat, the main concern is the chicken itself. Chicken that is not labeled organic often contains artificial growth hormones and antibiotics. The hormones and antibiotics are injected in the chickens when they are being raised on farms. While there has not been enough research to determine the long-term health risks of consuming meat with hormones and antibiotics, it is sensible to not want to take chances with your health. As such, it is worth the effort to look for a store that sells organic products. And just as well, worth paying a little more for organic chicken. In addition, organic chicken has only been fed organic grain. It is definitely the healthiest option when it comes to the canned version of chicken. 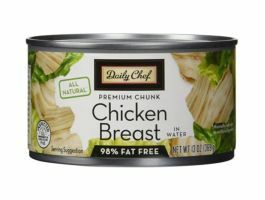 When you develop the habit of reading labels on every product you buy, you can purchase the healthiest canned chicken. You will know it is organic, and you will know exactly what is in the can. Reading not only the nutrition label but also the ingredients in the fine print. This will let you make sure that you’re not feeding your family ingredients that are harmful to them. However, one thing to keep in mind is that not all organic chicken is low in sodium. This is another reason you should always read labels. In fact, some organic chicken have a higher sodium content than non-organic chicken. The words low sodium should be on the label if you want the healthiest product. Chicken that has been injected with antibiotics and growth hormones should be avoided. You should also avoid canned chicken with a high sodium content. If you choose low-sodium, organic chicken, it can be as healthy as fresh chicken. Quick and simple to prepare, and very inexpensive, you can enjoy canned chicken in sandwiches, salads, or include it in your favorite recipes. You can have all the health benefits of chicken when you make smart choices.